If you’ve been around the game long enough, you know that youth hockey has some of the best parents around. They’re most often family-oriented, committed and passionate for the game. 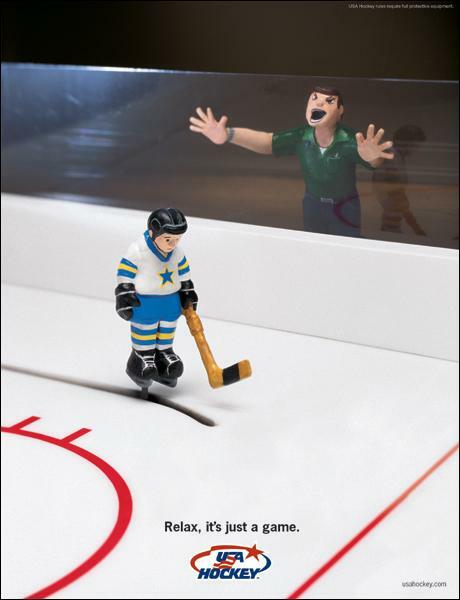 However, a study by Harvard sociologist Hilary Levey Friedman found that youth hockey has the craziest parents. Unfortunately, being financially and emotionally invested in their children and the sport, there are instances where youth hockey parents allow their emotions to get the best of them. Rather than maintain perspective that youth hockey is designed to provide opportunities to learn life lessons and, most importantly, HAVE FUN, we’ve all witnessed parents berate officials and be hard on their son or daughter following a game. They’re naive and often riddled with poor decision making. And that’s completely okay! Being young, now is their opportunity to learn and hopefully avoid repeating mistakes in adulthood. The referees are human and will make mistakes. Can you imagine if you had an audience of people looking over your shoulder while you worked? And proceeded to yell and pound on your ‘window’ every time you made a mistake? And NEVER acknowledge when you do a good job? Me either. Please don’t subject our part-time, youth, amateur refs to this. How would our sons and daughters play without them? 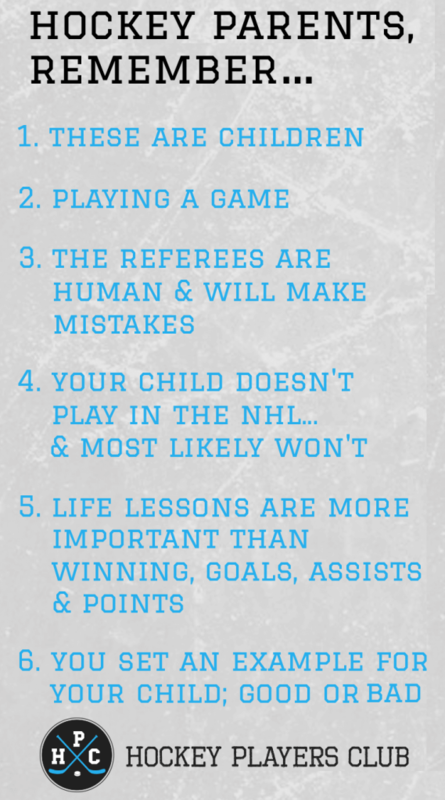 Your kid doesn’t play in the NHL…and most likely won’t. 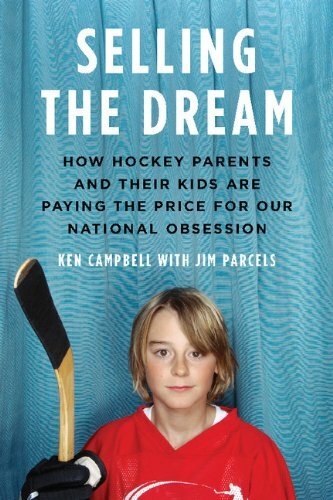 From a study for the book Selling the Dream: How Hockey Parents and Their Kids Are Paying the Price for Our National Obsession, a hockey-playing boy in Ontario [arguably the #1 hockey hotbed in the world] has a 0.16% chance of being drafted into the NHL, and a 0.02% chance of actually having an NHL career. The reality is your child won’t play in the NHL. What’s more likely is they’ll end up playing in a beer league somewhere in twenty years with their friends and co-workers…and that’s perfectly okay! Keep in mind that your player isn’t playing for their next meal; they’re playing to HAVE FUN. It should be our goal to maximize our kids’ fun while acknowledging the numerous “bigger picture” benefits of playing the sport. Like: teamwork, accountability, perseverance, discipline, and mental toughness to only name a few. You set an example for your child; good or bad. As adults, we’re very fortunate to have the opportunity to demonstrate to our kids how to react to losses, poor officiating, injuries, victories, and all of the other outcomes or instances that occur competing in hockey. Let’s make sure we’re conducting ourselves in a fashion we’ll be proud to see our youth emulate. If you keep these things in mind it’ll all be worth it. Why I Love Pond Hockey… No Parents… No Ref’s…. Just Kids havin FUN….